First ice is always some of the best fishing of the year. Do not overlook relatively shallow water at first ice; especially if there is some aquatic vegetation or other shallow water cover (e.g. brushpiles). As the winter progresses, fish location will generally shift towards deeper water, but at first ice it may pay to check the shallows. I believe one of the most important keys to catching fish through the ice is to keep drilling holes and keep moving until you find fish. When you are ice-fishing you are basically fishing a relatively small area right below your hole. Sure, you can attract fish to your hole and get them to bite, but generally they will not travel great distances. If they are in the vicinity you will know in short order. If they are not there, you have to keep drilling holes until you find them. Sometimes you find fish on the first hole, sometimes it will be the 152nd hole. I love hunting pheasants in the snow. While waiting for the ice to thicken, my son and I spent some time chasing pheasants last week. Yes, it takes some work to trudge through all the snow we have, but it has been rewarding. 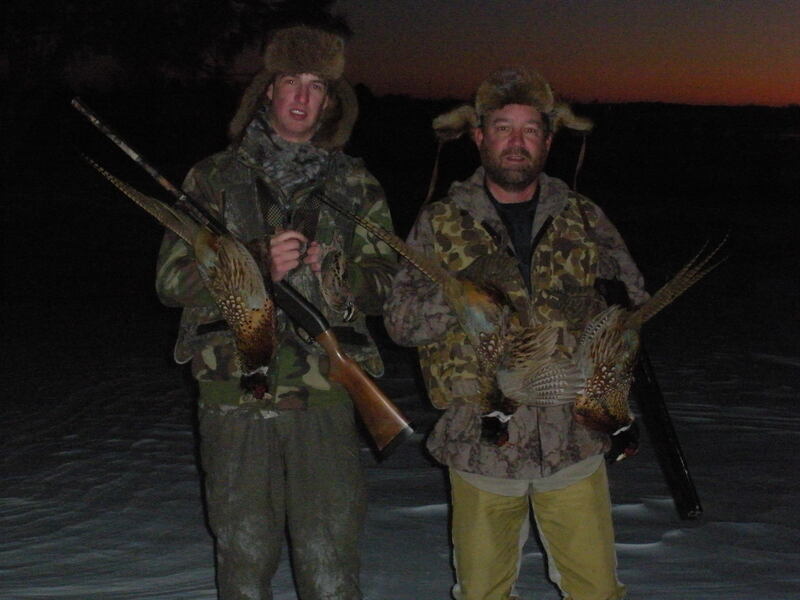 Three pheasants and a quail on one afternoon last week. 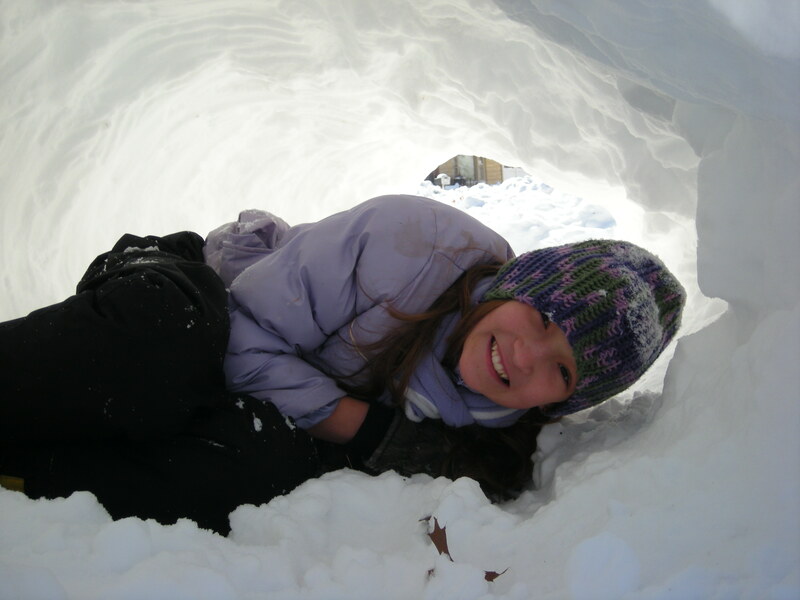 We survived the blizzard of 2009 last week. My daughter was outside playing when the storm hit, and she could not find her way 10 feet back into the house. 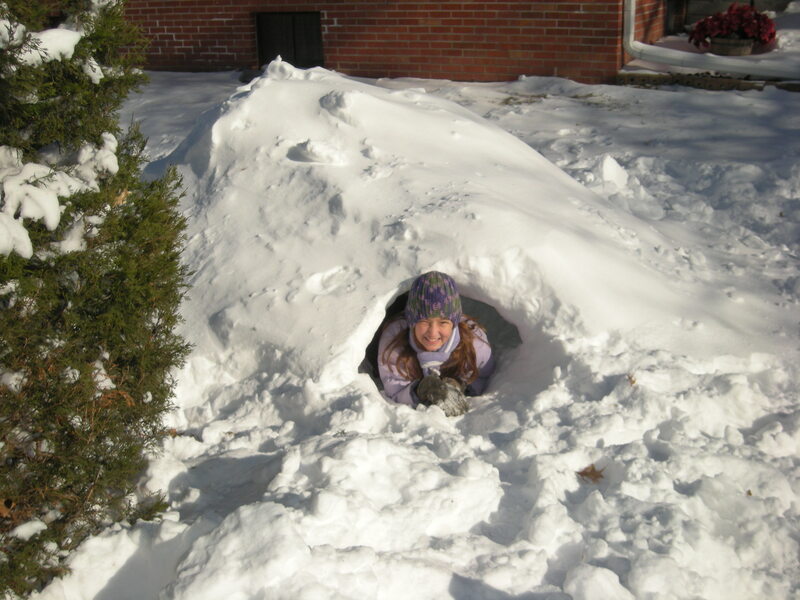 Fortunately she has been watching all the survivor shows on TV, so she knew how to build a shelter and survive the night. We found her in the backyard in her igloo the next morning. OK, before the social services workers show up at my front door–JUST KIDDING. But I tell you this because it is a fact that kids that spend time playing outside are healthier and happier! Sure, I want them to grow up to enjoy the outdoors and become anglers, hunters, and trappers, and it can all start by getting the kids off the computer, away from the TV and video games and getting them outside. They can spend time exploring, exercising, playing, and creating and it is all good. Between my daughter and her neighborhood friends we almost always have a bunch of kids playing in our yard, just like we did when we were kids, and I am very sure they are having a great time!